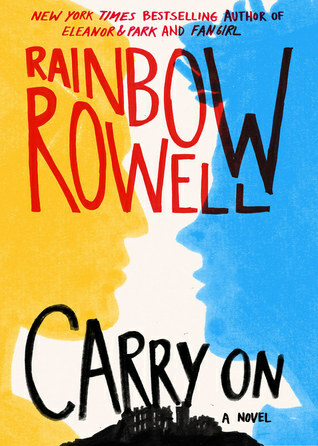 I’ve been looking forward to reading Carry On, by Rainbow Rowell, since I heard about it for a few reasons. First and foremost, I look forward to reading every Rainbow Rowell book I hear about. She’s an amazing writer and an amazing storyteller. Secondly, Fangirl is one of my all time favorite books. As I’ve written before, it’s a book so nice I reviewed it twice. While some readers of Fangirl didn’t like the Simon Snow asides, I was not in their number. I liked Simon and Baz and Penelope and was very excited to learn more about them their world. The final reason I wanted to read this book is that I like Harry Potter, which Carry On is definitely an homage to in many ways. So yes, I was looking forward to reading this book. I read it this week. And here are some of my thoughts. Overall, I liked this book. I think it was missing some of the Rainbow Rowell magic that I’ve enjoyed in her contemporary novels, but the writing was tight, the dialogue snappy, and the character relationships twisty, changing, and (always) interesting. I laughed a lot while reading this book. These are all good things. I think my biggest problem was that I couldn’t tell if this book was sincere or satire. A lot of it seemed like an overly exaggerated version of Harry Potter. This breaks down over time as characters’ archetypes are broken down, but it was still a hard feeling to shake. It takes a long time for Baz to enter the story. Once he did, my reading picked up and I became more invested in what was going on. He was by far my favorite character, and the romance (hopefully this isn’t a spoiler to anyone … look at the cover people!) was perfection. It’s funny because I read this and the genderswap Twilight this week, and both did in some ways feel more similar to fanfiction than books that are usually published through traditional means. Is Carry On a new favorite of mine? No. It’s not even a favorite within Rainbow Rowell’s books. However, it was a really fun read and I am really glad it exists! This entry was posted in Book Reviews and tagged books, carry on, Rainbow Rowell, YA by Alison Doherty. Bookmark the permalink.